Non-slip socks are great for wearing around the house. 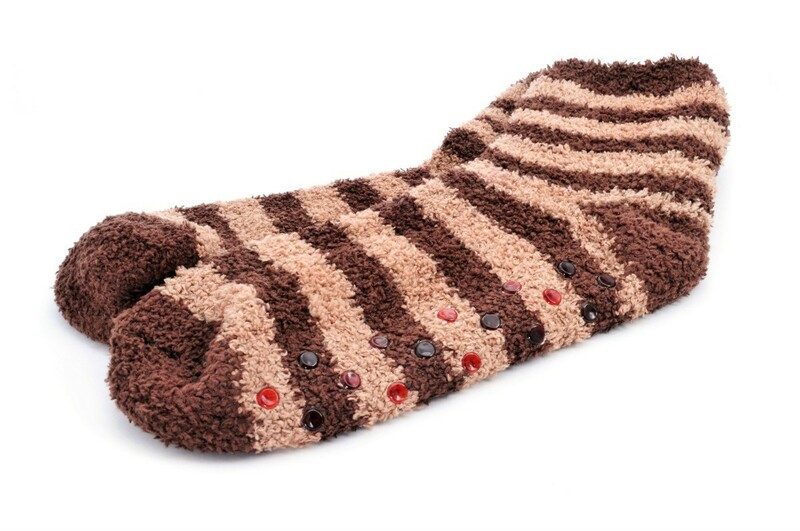 You can easily make your own version without the expense of buying these speciality socks. This is a guide about making non-slip socks. How can I make home-made "gripper" socks? The non-slip socks like hospital ones. What could be applied to the soles of regular socks to make that sticky stuff? Puff paint from the craft store (normally used to decorate t-shirts, shoes, whatever). You can also buy the non-slip stuff like on the feet of kid's pj's at joann fabrics. Fabric stores sell fabric that is made to be put on the bottom of sleeper feet or socks. It already has the nonskid nubbies. It isn't expensive, and it lasts longer than nubbies you might put on there yourself, such as with fabric paint or fabric glue. Go to a hardware store and buy clear silicone. It comes in a tube, usually near grout and molding supplies. Put the sock on a jar or bottle, squeeze the silicone on the bottom of the sock. Then use a putty knife or a plastic knife to spread it around and into the fabric. If you don't spread it in it will start peeling off the first time you wear them. There are various brands of rubberized plastic coatings that are used to spray paint/ brush-on paint/ or dip tool handles to make them non-slip. I bought a spray can of, to the best of my memory, "Plasticoat" spray paint at Menards for about 7 or 8 dollars two or three years ago which I found useful for a number of craft projects. Ask at your hardware or Menards/Home Depot/Lowes etc. Good Luck.